Collectible action figures have certainly come on a lot since I used to collect the Kenner/Palitoy versions in the '70s/'80s. Back then there was no elbow or knee joint, all they could do was swivel their head and move their arms and legs up and down from the shoulder and hip joints. These days there are many more points of articulation and these 6-inch figures are cheap enough to be used as toys as well as looking good enough to be kept as collector's items. The Range Trooper figure is nice and bulky, the down side of which is that he's not quite as easy to pose in different positions. He has a fur lined collar as well as a plastic coat designed to look like material. What's also impressive is the detail in the paint finish. The armour has scuff marks and dirt in several places and looking at images online the details are pretty much identical on every figure. 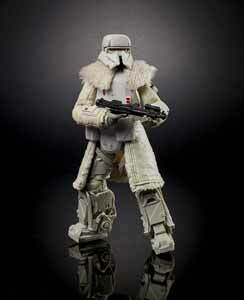 It's an impressive character and another beauty to add to your Black Series range. 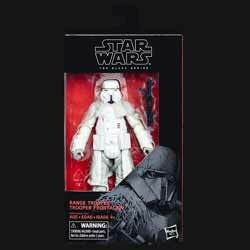 The Range Trooper is number 64 in the every growing series.